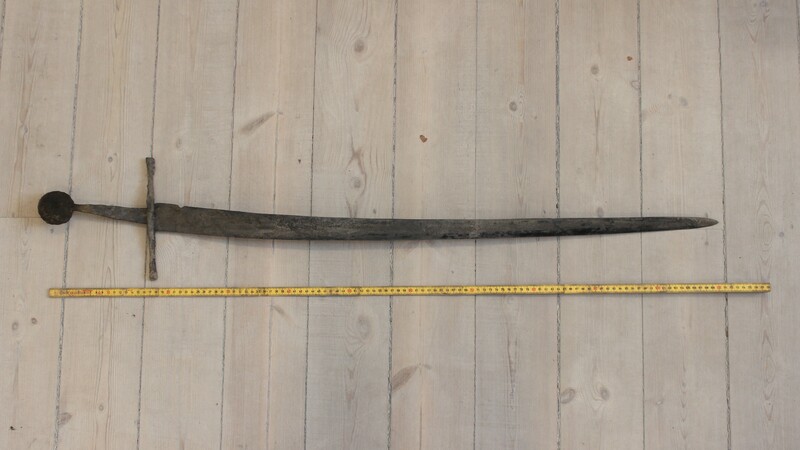 Crewmen working on a sewer project in Aalborg, northern Denmark, unearthed a 14th century sword on Tuesday. 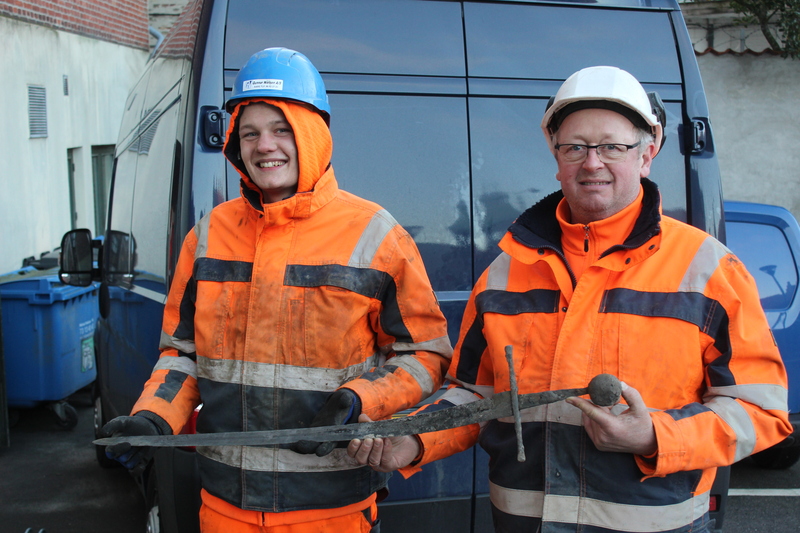 Plumber Jannick Vestergaard and machine operator Henning Nøhr were digging on the west side of Algade, a street in the city’s downtown, when a long blade emerged from the ground. They contacted the Northern Jutland Historical Museum which dispatched archaeologist Kenneth Nielsen to examine the artifact and find site. It is a double-edged sword with a blade three feet long (93 centimeters) that is still sharp. The entire sword, hilt included, is 44 inches long. Both sides of the blade have a fuller (inaccurately known as a “blood groove”) down the full length which was used to lighten the weight of the sword without weakening it. Indeed, the whole swords weighs just over a kilo (2.2 lbs). The hilt has a circular pommel and a straight cross-bar with a round cross-section. It is of extremely high quality. This style of sword was in use as early as the 12th century through the early 15th century. Museum archaeologists have been monitoring the municipal sewer excavations, documenting the stratigraphy of Aalborg. 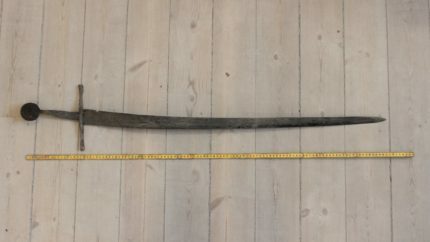 The sword was found in a waste layer on top of the street’s oldest paving. Previous findings in that layer date to the 1300s, which is the basis for the preliminary dating of the sword. Swords like these were enormously prized, the property of the warrior elite and so expensive that only noblemen could afford them. They were not, as a rule, dropped, forgotten and buried on city streets. The few that have been unearthed were found in graves, buried with their owners as emblems of their status as fighters of noble rank. There is a cemetery nearby, but no trace of a grave was discovered at the find site. The unusual location may be an indication that the sword was lost during a violent encounter and buried under the thick mud of low-lying ground before it could be recovered. There are marks from combat on the blade, and there were certainly plenty of opportunities for battle in the 1300s. During the first half of the century, the city was part of the Germanic province of Holstein and there were numerous clashes between the Danes and Saxons before Denmark’s King Valdemar IV received the province as part of his bride’s dowry when he married Helvig of Schleswig in 1340. The sword is now in the process of being cleaned and conserved. Once stabilized, it will go on display at the Aalborg Historical Museum on Algade a hop, skip and a jump away from where it was discovered. This entry was posted on Thursday, February 7th, 2019 at 4:38 PM	and is filed under Medieval. You can follow any responses to this entry through the RSS 2.0 feed. You can skip to the end and leave a response. Pinging is currently not allowed. D’ye think you could sever a man’s head with one jolly good swipe? The wars between Sweden and Denmark 1388–1389, the involvement of the Hanseatic League and the ‘Victual Brothers’ as a guild of privateers, who turned to piracy, may have played a role there. As far as those pirates would be concerned, their names are Störtebeker, Gottfried Michaelsen, Hennig Wichmann and Magister Wigbold, …and Dearie, most of them were ‘swiftly’ decapitated in 1401, – i.e. with a sword. The appearance of this particular one seems rather special, i.e. the blade is certainly of good quality, if after 700 years it is still sharp, but the whole thing looks a bit out of true. Maybe it was meant to look like that, or maybe it was not. Besides, to pack a boat with plague victims, and to land it on purpose at a preselected spot, might already count as some early form of biological warfare. When it come to Danish rulers, in addition to Valdemar IV, his dad (known as ‘the king who mortgaged Denmark to the Germans’) and Valdemar’s daughter Margaret I of Denmark, Margrete Valdemarsdotter, are interesting characters. The Kalmar Union (Lat. : ‘Unio Calmariensis’, 1397 to 1523) joined Denmark, Sweden and Norway, with Iceland, Greenland, the Faroe Islands and the Northern Isles. “‘swiftly’ decapitated in 1401 – i.e. with a sword.” Yes, but could it be done with that one? I picture an executioner’s sword as a large object needing both hands. Is the one pictured a one-handed sword for a man carrying a shield, or is it a two-handed sword for a man who is well armoured? It doesn’t look to me as if it’s a two-handed job unless the swordsman had little hands. About 11 cm for two hands wearing armoured gloves? Nah, I don’t think that it is an executioners sword. However, it does not look totally different to the ones that were depicted when those pirates lost their heads in Germany, nor to the ones that are used currently each and every Friday, ..or not every Friday, in Saudi.